I first set out to do the Global Catalyst Award in Year 7, and this took me two terms to achieve. In Year 8, I set out to do a specialist award called the Global Athletic Award, building on the achievement and activities of my Global Catalyst Award. Doing the Athletic Award was very different to the Catalyst Award as all of my activities for the Athletic Award were focused on one main goal – to improve the life of my young deaf friend by raising money to improve her hearing. This was a great challenge which was quite hard since I had to cycle 459 km but it was worth it because now I feel good about the fact that I have helped someone less fortunate than me. 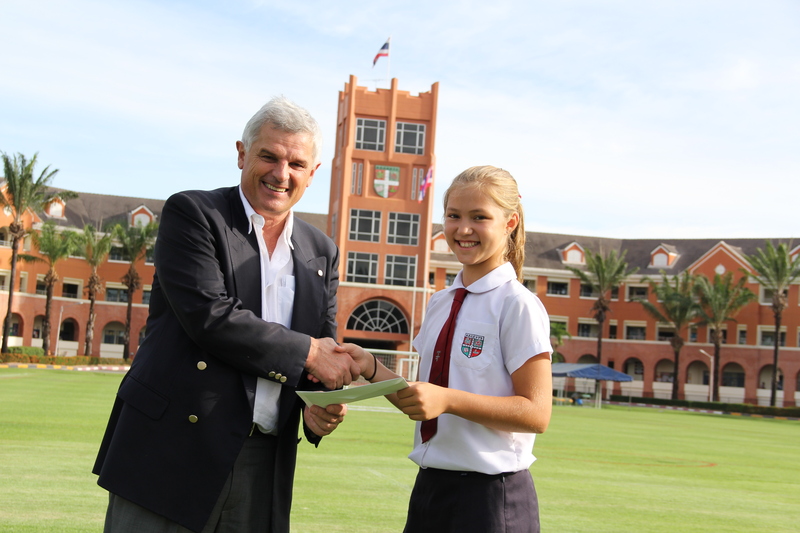 Poppy was also awarded the Brittany Tang Bursary for Outstanding Global Citizenship and will be awarded the Kurt Hahn Medal for commitment to service from the Round Square organisation in Jordan in October at the global conference. This award is only presented to one student from all the Round Square schools each year and only if someone has met the criteria set out by the awarding committee. Congratulations Poppy on being an amazing global citizen. We look forward to hearing about your progress and achievements in becoming a Global Entrepreneur. This entry was posted in Challenged with a Sense of Personal Adventure, Global Catalyst, Reflective Practice, Target Setting and tagged Global Citizenship Award, Kurt Hahn, Round Square by Paul Crouch. Bookmark the permalink.